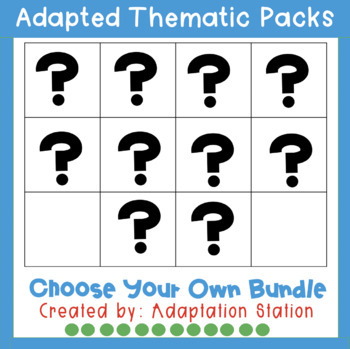 This listing allows you to choose any 10 packs from my Adapted Thematic Pack line to build your own bundle. First, purchase this listing. Then, take a look at the mega bundle and select the 10 packs you want. Send me an email to adaptstation@gmail.com with proof of purchase and the 10 titles you want. I will create a google drive and share the folder to the email you use to contact me-all orders will be completed within 5 business days, Monday-Friday. Please note, there is nothing in this download and I will not be able to build the bundle without hearing from you. I also have no way to contact individual buyers so it is imperative you email me to begin the process. Download the preview to see a sample of what is included!